Jotwell is taking a short summer break. Posting will resume on Tuesday, September 3. Thank you for reading — now please consider helping us find more readers. 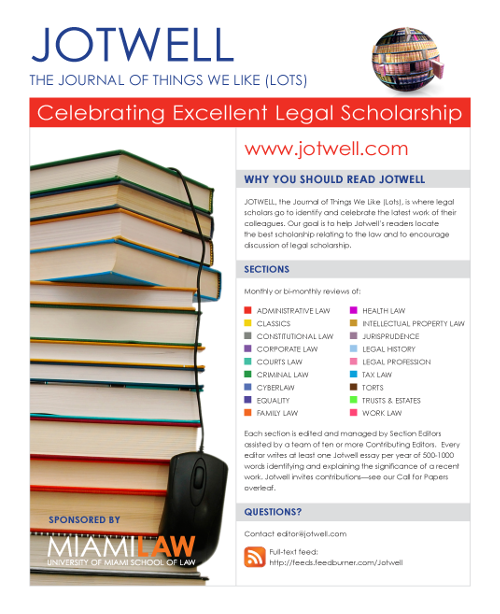 Tell a friend about Jotwell. And if you are an academic reader, please consider recommending Jotwell to your students. Does Congress Really Mean To Delegate Interpretative Authority To Agencies? Abbe Gluck & Lisa Bressman, Statutory Interpretation From the Inside—An Empirical Study of Congressional Drafting, Delegation, and the Canons: Part I, 65 Stan. L. Rev. 901 (2013). This coming year marks Chevron’s 30th anniversary. Westlaw reports that Chevron has been cited in over 66,000 sources, including in nearly 13,000 articles. Despite the ink already spilled, until now no one had empirically investigated the core assumption underpinning Chevron deference—that Congress actually intends to delegate interpretative authority to federal agencies when it leaves ambiguities in statutes the agencies administer. Professors Abbe R. Gluck and Lisa Schultz Bressman recently sought answers to this question (and many others). They interviewed 137 congressional counsels, asking them 171 questions about the canons, legislative history, and administrative law doctrines. Their findings will appear in a two-part series in the Stanford Law Review. The 125-page part one was just published, along with a methods appendix, and there is a lot to like about this piece. Continue reading "Does Congress Really Mean To Delegate Interpretative Authority To Agencies?" Nicole Buonocore Porter, Martinizing Title I of the Americans with Disabilities Act, 47 Ga. L. Rev. 527 (2013), available at SSRN. For years, plaintiffs claiming discrimination under the Americans with Disabilities Act (ADA) routinely lost because they were unable to establish the existence of a disability. The result was that arguably the most important aspect of the ADA—the requirement that employers make reasonable accommodations to the known disabilities of their employees—went largely ignored in employment decisions and legal scholarship. All of that started to change with the passage of the ADA Amendments Act of 2008 (ADAAA). With the ADAAA, Congress expressly overruled some of the more restrictive interpretations of the definition of disability, thereby increasing the number of individuals who could claim protection from discrimination under the ADA. Congress was clear that this is the result it wanted and that the proper focus in ADA claims should not be on whether an individual has a disability, but whether the individual is qualified for the position in question, i.e., whether the individual can perform the essential functions of a position, with or without a reasonable accommodation. Thus, the reasonable accommodation concept should increasingly take center stage in ADA cases. The problem, however, is that there has historically been so little focus on the concept in the employment context that there is considerable uncertainty as to what it means to say that an accommodation is or is not “reasonable.” Judge Richard Posner famously advanced a cost-benefit approach to the question of reasonableness, but his approach has had limited traction. Some judges have taken a case-specific, “I-know-it-when-I-see-it” approach, which leaves parties and their lawyers with little guidance. Nicole Buonocore Porter (Toledo) aims to address the problem of defining reasonableness in the accommodation context in her latest article, Martinizing Title I of the Americans with Disabilities Act. Continue reading "What Casey Martin Has To Teach Us About Disability Discrimination In The Workplace"
Adam Chodorow, Death and Taxes and Zombies, 98 Iowa L. Rev. 1207 (2013), available at SSRN. Taxes and brains—or rather, braaaaaaains—have always gone well together, but never quite like this. The income tax and the estate tax present intricate mechanisms for levying assessments on the living and the dead. In Death and Taxes and Zombies, Professor Chodorow turns his attention to the middle of this Venn diagram: the undead. The article reveals that Congress and the IRS have utterly failed to address this topic, creating significant uncertainty as to how the tax laws would apply in the event of a zombie apocalypse. The article leads the reader through a series of ordinary tax and legal scenarios and applies them to extraordinary circumstances. How do states address the question of what it means to be legally dead? When does federal law trump state law for purposes of determining whether an inheritance has passed? What constitutes taxable income? What are relevant valuation dates when property is transferred, and how are the basis rules applied in the context of transfers from a decedent? What are the loopholes in the estate tax and the income tax? And more important, how do these rules apply to zombies? Continue reading "Taxes and Brains"
Gideon Parchomovsky and Endre Stavang, Contracting Around Tort Defaults: The K4K Principle and Accident Costs (working paper, 2013), available at Docstoc. When two sophisticated parties jointly decide that, in the case of accident, each will bear its own costs and insure against its own losses, why should anyone care? The Restatement Third of Torts, for one, does not. Restatement Third of Torts: Apportionment of Liability §2 (1999) (“When permitted by contract law, substantive law governing the claim, and applicable rules of construction, a contract between the plaintiff and another person absolving the person from liability for future harm bars the plaintiff’s recovery from that person for the harm.”). In their article, Contracting Around Tort Defaults, Gideon Parchomovsky and Endre Stavang, however, sound a cautionary note about potential social costs of private contractual agreements to opt out of tort liability. If potential tort liability prods actors to adopt socially optimal levels of precaution, when parties disclaim that liability through contract, will actors “under-invest in precaution and fall short of the optimal level of care,” with deleterious impacts not on the contracting parties themselves but on third parties? In short, will we have less tort liability but more tort? The backdrop for Parchomovsky and Stavang’s question is an important one—oil and gas industry contracts that pervasively opt out of the tort system through a broad system of exculpatory agreements, sometimes referred to as “knock for knock” clauses. Courts determining the applicability of these agreements often focus their inquiries on the intent of the contracting parties to waive liability for negligence. Reeder v. Wood Cnty. Energy, LLC, 395 S.W.3d 789 (Tex. 2012), opinion supplemented on reh’g (Mar. 29, 2013) (“In construing a written contract, the primary concern of the court is to ascertain the true intentions of the parties as expressed in the instrument.”) Parchomovsky and Stavang’s critique suggests that the effects of waivers on nonparty potential victims should also be taken into account. Could the industry’s pervasive system of exculpatory clauses, which ensures that liability falls short of even the cost of physical harms from negligently caused accidents, have caused insufficient industry precautions and led to major accidents like the Deepwater Horizon spill? While the authors don’t offer a definitive answer, they do identify the potential for industry contracts to result in moral hazard problems and suboptimal precautions which increase hazards to third persons. Continue reading "Avoiding Liability But Not Tort"
Peter Diamond & Emmanuel Saez, The Case for a Progressive Tax: From Basic Research to Policy Recommendations, 25 Journal of Economic Perspectives 165 (Fall 2011). Too often, policy research relies more on the misleadingly elegant results of economic theory than on actual evidence. Tax policy discussions, as I will describe below, are especially prone to being infected by this evidence-free approach to analysis. Fortunately, two of the best public finance economists in the world, Peter Diamond and Emmanuel Saez, have recently provided a much-needed antidote: The Case for a Progressive Tax: From Basic Research to Policy Recommendations. To understand just how important their article is, it is necessary to appreciate the deep roots of the problem that their article addresses. As an economics graduate student, and later as a young economics professor, I often felt a deep sense of unease about the disconnect between economic theory and the empirical research that was relevant to evaluating that theory. Overwhelmingly, we learned in classes (and from theoretical scholarship) a series of “known results” that followed from the manipulation of economic models—results that, however nicely derived from the assumptions of those models, either were not backed up by any empirical research, or the magnitude of which turned out to be quite trivial. Continue reading "What Legal Scholars Need to Know About Economic Research on Taxation: The Evidence Thoroughly Debunks the Conventional Wisdom"
Steven A. Boutcher and Carole Silver, Gender and Global Lawyering: Where Are the Women?, Ind. J. Global Legal Stud. (forthcoming 2013), available at BePress. Globalization has been a hot topic for the legal profession for many years, but analysis of global law firms has mostly ignored something increasingly conspicuous in research on domestic law firms: gender. When I was doing fieldwork in American law firms’ China offices 5-6 years ago, I could not help but notice a fascinating phenomenon: most of these offices were staffed by an overwhelmingly large proportion of female lawyers, usually at the level of associates and legal assistants. This was in sharp contrast to the situation in Chinese domestic law offices, where women accounted for less than 20% of the lawyer workforce (see Ethan Michelson’s paper on gender inequality in the Chinese legal profession). I have been thinking about this puzzle for years and pondered some possible explanations, until I read the path-breaking article that Steven Boutcher and Carole Silver recently wrote on gender and global lawyering. In this article, Boutcher and Silver ask a basic question: Does globalization affect women differently than men in terms of status attainment in the law firm? The answer, not surprisingly, is yes, but the interesting part is how, and how much it varies from one place to another. Based on an original dataset of a sample of 55 U.S.-based law firms with overseas offices collected by Silver, Phelan, and Rabinowitz in 2006-2007, the authors examine the distribution of 6,211 lawyers in a total of 243 offices in seven different jurisdictions, namely, Belgium, China (mainland), England, France, Germany, Hong Kong, and Japan. The article classifies lawyers according to three variables: gender (male and female), education and licensing (local lawyers, U.S. expats, and other expats), and status in the law firm (partners, associates, and counsel). Then it uses a number of crosstabs to compare the status of men and women across jurisdictions, focusing on the issue of partnership. Continue reading "From Status to Mobility: On Gender and Global Lawyering"
Re’em Segev, Justification Under Uncertainty, 31 Law and Philosophy 523 (September 2012), available at SSRN. In this article, Segev defends a sophisticated analysis of the pro-tanto justification of actions taken under uncertainty (more precisely, with “partial information”) in both morality and law. Applied to law, Segev’s analysis challenges some mainstream views. Here’s the puzzle and Segev’s starting point: Thanks to mistake of fact, an action may appear “subjectively justified” but not “objectively justified,” and vice versa. A moral agent has a false but epistemically justified belief about a relevant non-normative fact; and if that belief had been correct, the action would have been (objectively) justified under a correct norm. Some would say that the act is subjectively justified, nonetheless. An action is objectively justified—the agent correctly acted according to a correct norm—but the action is not subjectively justified, given the agent’s epistemically justified (but false) belief about a relevant non-normative fact. In either case, was the agent’s act really justified? The answer provided by an objective conception of justification under uncertainty appears to conflict with that produced by a subjective conception. Segev denies the conflict. He holds that the question is ambiguous; its answer depends on which “aspect” of the relevant normative standard the question concerns. Continue reading "Mistake of Fact, Moral Justification, and Justificatory Defenses in Law"
Hidetaka Hirota, The Moment of Transition: State Officials, the Federal Government, and the Formation of American Immigration Policy, 99 Journal of American History 1092 (March 2013). Where does federal plenary power over immigration come from? For a long time now, scholars have pinpointed the definitive starting point in the 1889 Supreme Court case of Chae Chan Ping v. U.S. (aka The Chinese Exclusion Case), which announced that immigration control was “an incident of sovereignty” and thus a matter for Congressional—not state or judicial—power. In an excellent new article, historian Hidetaka Hirota challenges this basic assumption. He argues convincingly that federal plenary power arose not only from the Court’s reading of international and constitutional law, but also from a long history of state practices of migrant policing and control. The federal government took political, administrative, and procedural cues from the state immigration regimes that predated Chinese Exclusion, particularly those in the influential states of New York and Massachusetts. Hirota is not the first to look at state immigration power. As he acknowledges, Gerald Neuman and Kunal Parker have done foundational work in this area, exploring the ways that state regulation of the poor and of fugitive slaves served as precursors to federal immigration control. Hirota’s focus is on the ways that states dealt with foreigners arriving from Europe in ports along the Atlantic coast. The border that mattered in this period was a coastal one, not a land border. With no modern visa system in place, state officials had no control over who would seek to land on their shores. Hirota recounts how the Atlantic seaboard states developed a comprehensive approach to preventing or limiting the migration of the poor, as well as removing them after entry if necessary. State officials created boards of immigration to oversee efforts and devised systems of bonds and taxes. Ship captains who brought passengers who were “likely to become permanently a public charge” had to supply bonds in the event that a passenger required poor relief. If the ship companies did not provide the bonds for those passengers, state officials would prohibit the passengers in question from landing. Ship companies would have to return the passengers to Europe on their own dime. States also charged a head tax (in lieu of bonds or in combination with them), which was a fee on all healthy passengers. This was used to offset the cost of receiving destitute passengers. Of course, these taxes would give rise to the Passenger Cases in 1849 and to Henderson v. New York in 1876. In combination, these cases greatly limited the states’ power to tax passengers, based on the Supreme Court’s interpretation of the Commerce Clause. Continue reading "The State Origins of Federal Plenary Power"
Deepa Varadarajan, Improvement Doctrines, 41 Geo. Mason L. Rev. (forthcoming 2014), available at SSRN. Scholars often debate whether intellectual property really is property at all. This is far more than just a descriptive inquiry. Asking how law regulates tangible and intangible goods differently can deliver valuable insights about the optimal governance of real property and chattels, patents and copyrights. Deepa Varadarajan’s engaging piece, Improvement Doctrines, forthcoming in the George Mason Law Review, represents an important contribution to the growing literature about what property and IP can help us learn about one another. Improvement Doctrines focuses on the fascinating but underappreciated body of doctrines in physical property law that favor—and sometimes entirely excuse—trespass and conversion that is done in good faith and that adds significant value to the res. Professor Varadarajan’s article then uses these improvement doctrines as a lens though which to analyze intellectual property’s relatively anemic attempts to take account of improving but unauthorized uses of patented inventions and copyrighted works of authorship. In so doing, Improvement Doctrines identifies and illuminates a series of fascinating problems that span both physical and intellectual property law. Professor Varadarajan’s article begins with physical property’s improvement doctrines and moves into an investigation of unauthorized improvement in intellectual property law. In so doing, though, it neither assumes that tangible and intangible property law must mechanically mirror each other, nor insists that the differences between corporeal and incorporeal goods render any such extrapolations useless. Rather, Improvement Doctrines’ primary analytical driver is its thoughtful synthesis of the efficiency and equity rationales underlying ameliorative waste, accession, adverse possession, and mistaken improvement of land. This discussion alone yields a number of valuable insights, such as the creative point that adverse possession warrants categorization as an improvement doctrine even though its substantive law does not require enhancements to land. Continue reading "Unauthorized Improvement Across Property Law"